After a couple of weeks of hiatus, Investing.com comics are back. And what better way to mark their return than with a sequel of sorts. This week's comic is about the ongoing turmoil in the markets and the effect said turmoil is having on emerging markets. 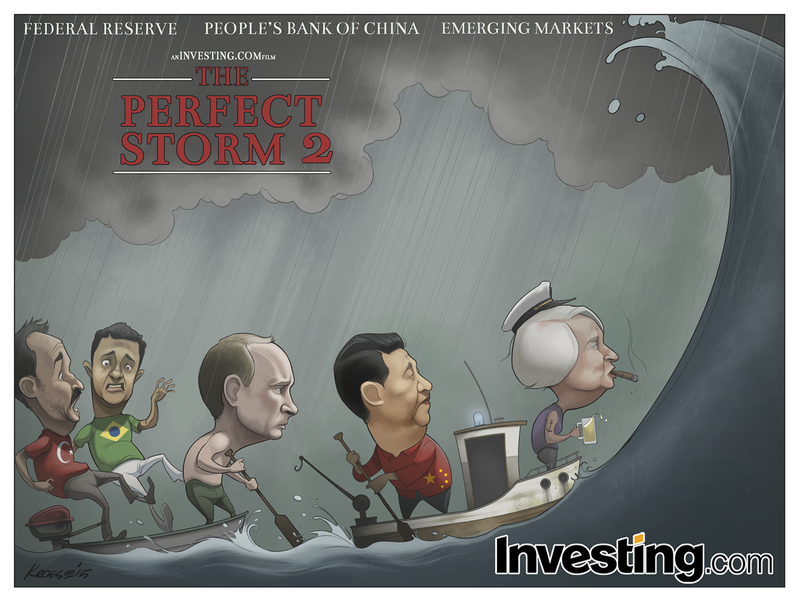 I was asked by the crew at Investing.com to do a new version of "The Perfect Storm" comic from several weeks ago. Only this time, I would be adding characters. Behind the boat bearing Yellen and Xi Jinping, they asked me to add a second, smaller boat with Vladimir Putin at the helm and two men (Turkish and Brazilian) falling out the back. This comic was a bit more of a challenge than I was expecting. I figured I could just draw the three dudes in a boat, dust off my hands in a cartoonish fashion and have a beer. But because the other elements of the original comic had to stay in place, it was spatially tricky. It was tough to draw the Turkish and Brazilian man falling out of the boat with space at such a premium. There wasn't enough room to draw the action the way I would have preferred. It changes the composition fairly dramatically as well. And it's a bit cluttered. There's a lot going on now in this comic. But I think Putin's caricature is pretty good. And I also made an effort to draw the Turkish and Brazilian guys so that they look like they're from those countries. Ordinarily I might have just drawn a couple of generic cartoon guys wearing flag shirts and called it good. But my "generic" people tend to be a bit bland, so I decided against default impulses. Ok, that's alls I got for now. Back to the Future: History's gonna change.